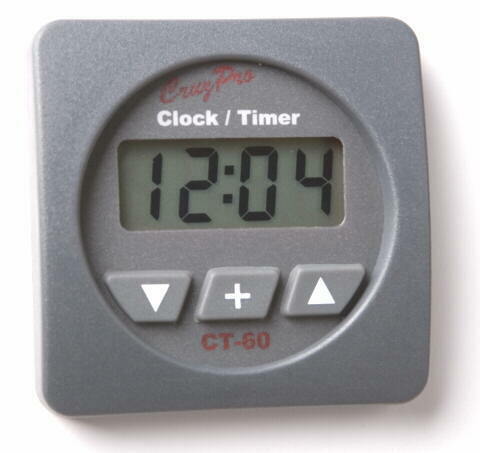 The CT60 Digital LCD Clock provides accurate low cost display of time, race and watch timers. Five levels of backlighting can be selected and all set-up and calibration constants are saved to non-volatile memory. Connect a GPS output into the CT60 and the CruzPro CT60 will auto-set to the correct time whenever GPS NMEA 0183 is available. 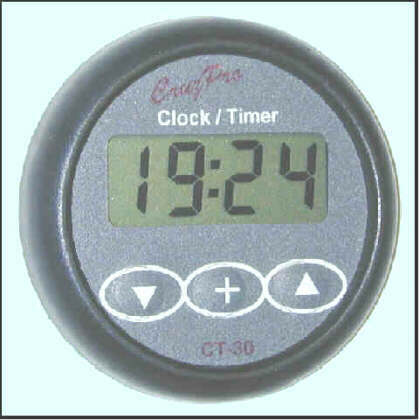 With a press of the button you can display time-of-day, a downcounting race timer or start/reset/re-start a watch timer. Both race and watch timers count up after reaching zero and both are easily programmed. The time-of-day clock has 8 different programmable alarms for all those radio schedules, weather fax warnings, etc. 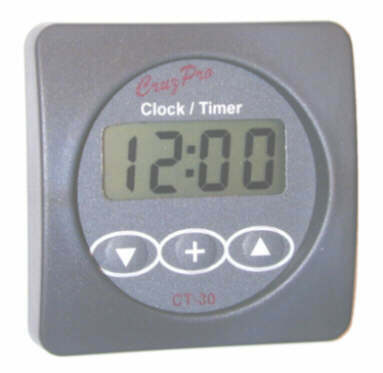 The clock can be set for 12 or 24 hour display format and is accurate to better than 5 seconds per day. The clock is factory calibrated but can be adjusted with the front panel switches and calibration data saved to non-volatile memory. When used as a Watch Timer, the CT60 is programmable with a time interval anywhere from 1 second to 99 minutes and 59 seconds. When the DOWN key is pressed, the programmed time interval is displayed and starts counting down to zero. When 10 seconds remain, the CT60 quietly "clicks" down to zero. The Watch Person can press the DOWN key at this (or any other) time, re-starting the watch timer without the alarm waking other crewmembers. 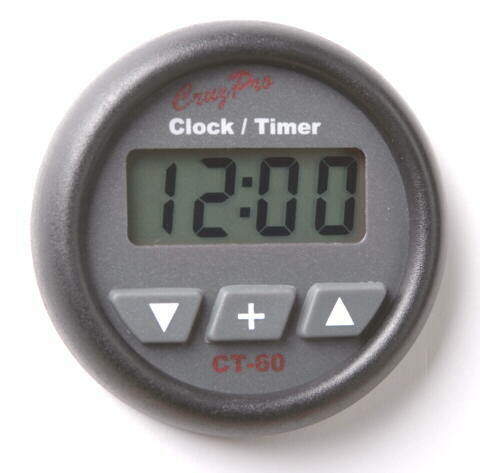 If the DOWN key is not pressed before the watch timer reaches zero, an 85 dB alarm wakes everyone and the CT60 watch timer starts to count up from zero. Disgruntled and sleepy crewmembers can tell at a glance how long the Watch Timer has been asleep or treading water. All the other functions of the CT60 are still available while in Watch-Timer mode. The CT60 has a large LCD display yet draws only 0.018 amps. 5 levels of backlight (including OFF) can be selected from the front panel and is saved to non-volatile memory. The CT60 outputs NMEA 0183 serial data line at 4800 BAUD. This ASCII information can be sent to a computer or used to repeat the display information elsewhere such as the CruzPro RP60 and RP110 NMEA Remote Data Repeaters (see www.cruzpro.com/rp30.html and www.cruzpro.com/rp110.html).